For the months leading up to the election, immigrant youth, youth of color, and their allies across the state door-knocked, phone banked, not only because we want the immigrants and people of color to live unafraid of cops and immigration agents, but also to demand well-funded public education, women’s rights, labor rights, and LGBTQIA rights. Our vision of Texas is one that will ensure we can all live with dignity and respect. As we look ahead to the 86th Texas legislative session, Texas Democrats should know that power concedes nothing without a demand. It never did and never will, much less when you back a man who is against the values of your supporters and constituents. Democrats who support Bonnen, how can we trust you? How will we know you will stand by our side? Will you opt for access to meetings or committee positions over advocacy, votes and action grounded in our humanity, equity and dignity? As a community organizer in immigrant communities for almost 15 years, I’ve learned that a leader must listen to the community — they hold the power. 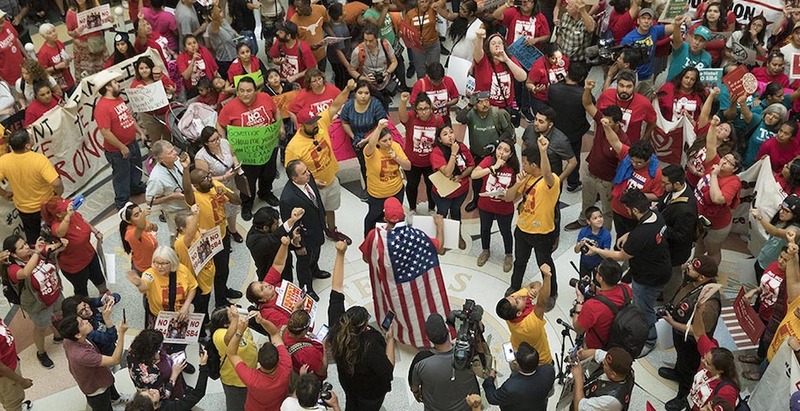 Last May 29, my mother, my sister, members of United We Dream, and hundreds of allies were inside the Texas House chamber when outgoing Texas Freedom Caucus member, state Rep. Matt Rinaldi, called Immigration and Customs Enforcement on immigrant youth and people of color protesting the racist SB 4. He chose his words and his moment — and the community chose to organize, identify voters and mobilize. Now Rinaldi is out of a job, having lost to Democrat Julie Johnson. When we took over the Capitol we celebrated our resilience and resistance, and nothing about that has changed. After this not-so-powerful play by these Texas Democrats goes on the books, and bills against immigrants and people of color are filed left and right, some things will remain the same: Immigrants are here to stay and we will continue to rally our community. To those who hold us back and try to stand in our way: We are ready to continue fighting.